Walt Disney World is the site of the biggest theme park/vacation resort in the United States. But what better way to ferry guests around than on a 23.6 km monorail system? Even though it is only a theme park resort, their twelve monorails at peak capacity can carry over 200,000 people a day! But unlike a surface light rail or elevated heavy rail line, the Walt Disney World Monorail system is very aesthetically pleasing. 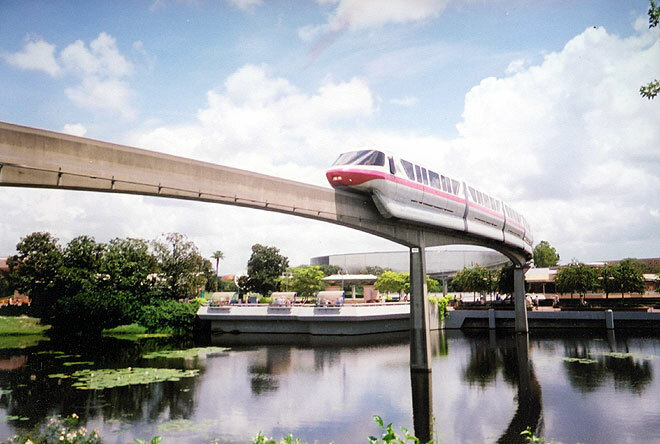 In a major city with little green space, a monorail system with wonderful landscaping would be badly needed and wanted. So, to give you some idea of the possibilities of monorail landscaping, I have taken some pictures on a recent trip (Summer 2004). 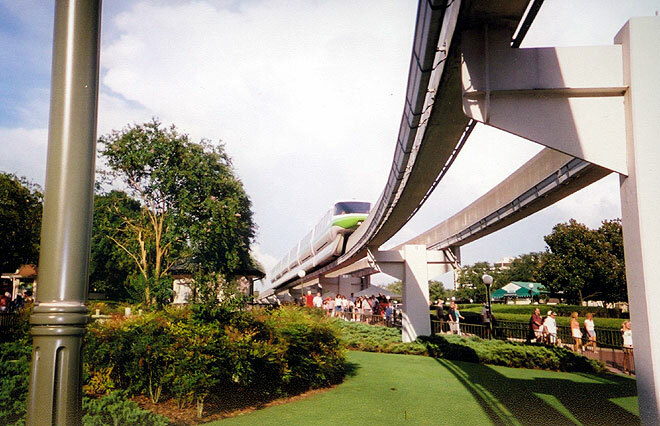 Here are some of the ways landscaping has been used to augment the pleasing aethstetics of an environmental friendly monorail system. We'll start out with something simple - grass. 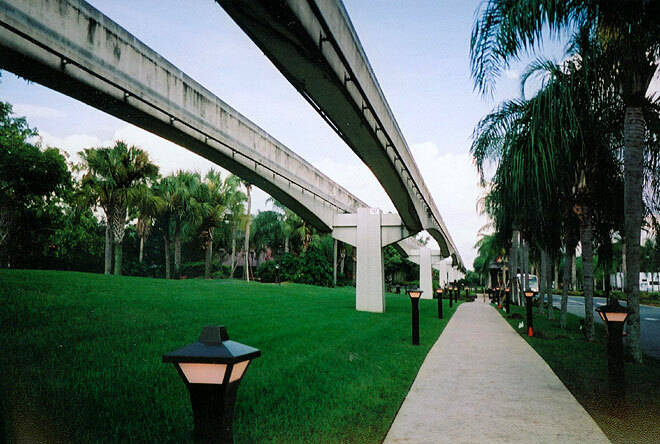 The WDW Monorail System has pylons about every 110 feet, and the guideway itself casts little shadow, allowing almost any type of plant, shrubbery, or dwarf trees to grow underneath it. Imagine this being the downtown of a major city and the monorail is built down the median of a boulevard. Imagine the positive aesthetical impacts of just planting grass on the median. Light rail can't boast that. 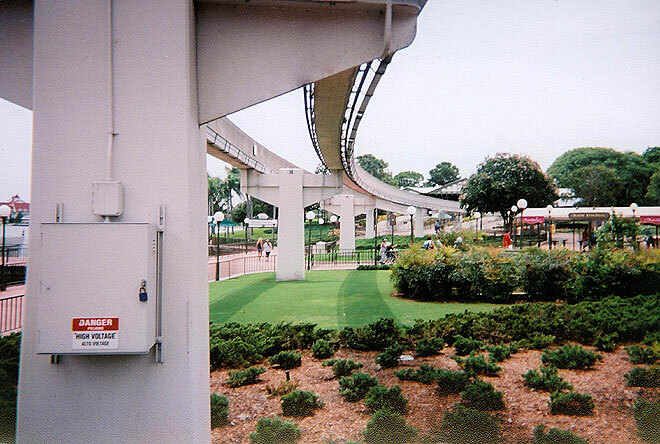 Here there is grass under the monorail, but this time we see little hedges and shrubbery. Compare this picture to the above one and see what a little mulch and plants will do to make the scene look better. The small shadow made by a monorail system is very evident here, not hampering the growth of the landscaping. This shot shows more landscaping under the beamway. Water is also common in many cities, whether it be a river, lake, or bay. Monorails easily traverse across bodies of water without needing large fill separating the lake in two, or big and bulky bridge structures. 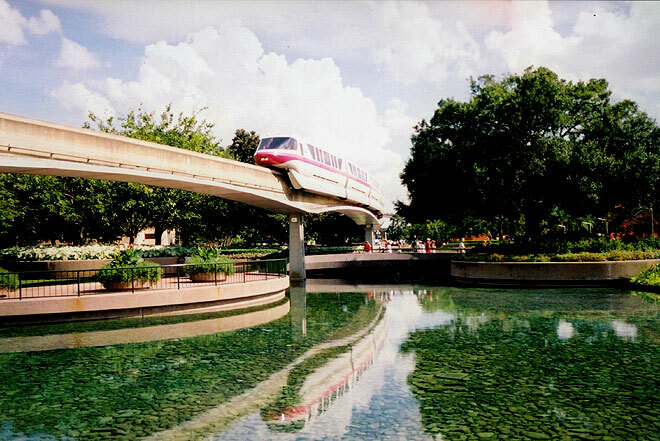 This beautiful shot of Monorail Pink traveling down the beamway over the clear reflecting pools in EPCOT. Note the drip pan in this shot under the beamway. Light rail proponents are quick to point out that drip pans are ugly. In this shot and the one below, the drip pan does little to affect the over all effect of the monorail beam, if any. Even with drip pans on a monorail (whether single beam, or a dual beam guideway), the footprint and visual impacts of monorail is far less obtrusive than elevated light rail! In this final look at landscaping at Walt Disney World, you can once again see the minimal impact of the drip pans. Also note the potted plants in the planters. These can easily be filled with colorful flowers and placed under the beamway on a narrow median strip along a street. I'd like to see light rail try to build through here without destroying any of the landscaping. To conclude, monorail offers the most landscaping options for any city while still being an effective transit system. 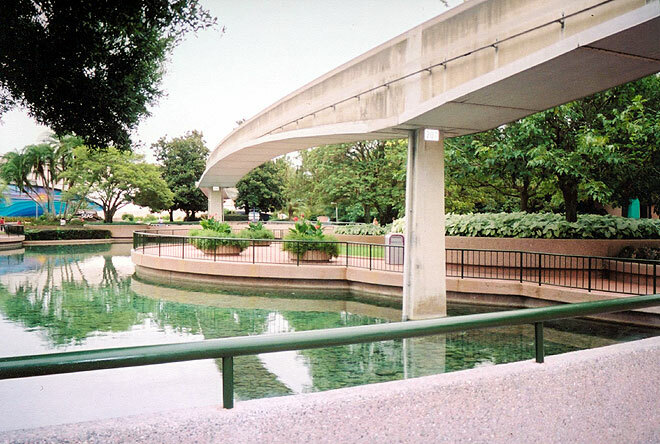 No surface light rail system can allow as much landscaping possibilities as monorail. Even with drip pans, monorail beamways are still narrower than light rail. For the urban planner and environmentalist alike, monorails definitely offer a very attractive choice for any city.